All you need to get going with FPGA devices. A FPGA development board, VHDL compiler, FPGA design tutorials, simulation tools and USB programmer in one FPGA starter kit. 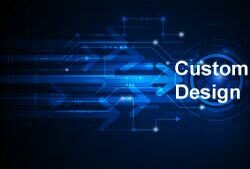 Ideal for FPGA design, developent and training from FPGA basics to full embedded design. 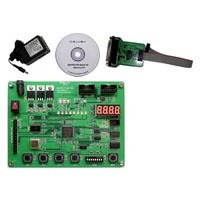 The FPGA evaluation kit uses Altera Cylcone II EP2C8Q208C8 FPGA (8250 LE) and includes schematic entry and VHDL compiler, with a complete FPGA board and FPGA programmer. 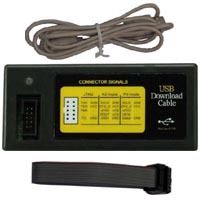 USB Blaster cable that replaces older parallel port BitBlaster cable. Fully compatible with Altera USB Blaster and Quartus II software. This downloader is available for Windows 2000, Windows XP, and Linux systems and also supports Quartus II Programmer and Quartus II SignalTap II Logic Analyzer. 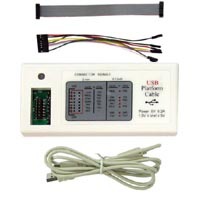 This USB downloader is perfectly compatible with Xilinx Platform Cable USB, suitable for use in programming and configuration of Xilinx devices using ISE software, version 6.3.03i for the Windows operating system or 7.1i for the Linux operating system or later. The downloader is available for Windows 2000, Windows XP, and Linux systems.